Pneumocystis jiroveci pneumonia (PJP), formerly known as Pneumocystis carinii pneumonia (PCP), is the most common opportunistic infection in persons with HIV infection. Pneumocystis first came to attention as a cause of interstitial pneumonia in severely malnourished and premature infants during World War II in Central and Eastern Europe. Before the 1980s, fewer than 100 cases of PJP were reported annually in the United States, occurring in patients who were immunosuppressed (eg, cancer patients receiving chemotherapy and solid-organ transplant recipients receiving immunosuppressants). In 1981, the Centers for Disease Control and Prevention reported PJP in 5 previously healthy homosexual men residing in the Los Angeles area. P jiroveci is now one of several organisms known to cause life-threatening opportunistic infections in patients with advanced HIV infection worldwide. Well over 100,000 cases of PJP were reported in the first decade of the HIV epidemic in the United States in people with no other cause for immunosuppression. While officially classified as a fungal pneumonia, PJP does not respond to antifungal treatment. Although a histopathologic demonstration of the organism is required for a definitive diagnosis (see Histologic Findings), treatment should not be delayed. Treatment of PJP may be initiated before the workup is complete in severely ill high-risk patients. Treatment of PJP depends on the degree of illness at diagnosis, determined on the basis of the alveolar-arterial gradient. See the A-a Gradient calculator. Antibiotics are primarily recommended for treatment of mild, moderate, or severe PJP. Trimethoprim-sulfamethoxazole (TMP-SMX) has been shown to be as effective as intravenous pentamidine and more effective than other alternative treatment regimens. Corticosteroids are used as adjunctive initial therapy only in patients with HIV infection who have severe PJP. Preventive measures (eg, smoking cessation and chemoprophylaxis) can play an important role in disease management. The taxonomic classification of the Pneumocystis genus was debated for some time. It was initially mistaken for a trypanosome and then later for a protozoan. In the 1980s, biochemical analysis of the nucleic acid composition of Pneumocystis rRNA and mitochondrial DNA identified the organism as a unicellular fungus rather than a protozoan. Subsequent genomic sequence analysis of multiple genes including elongation factor 3, a component of fungi protein synthesis not found in protozoa, further supported this notion. Further evidence of human transmission has been found in cases of recurrent pneumonia in which the genotype of Pneumocystis organisms in the same person differed in prior episodes. Despite this, barrier precautions are not required for patients hospitalized with P jiroveci pneumonia (PJP) except to protect other patients with depressed immunity. Disease occurs when both cellular immunity and humoral immunity are defective. Once inhaled, the trophic form of Pneumocystis organisms attach to the alveoli. Multiple host immune defects allow for uncontrolled replication of Pneumocystis organisms and development of illness. Activated alveolar macrophages without CD4+ cells are unable to eradicate Pneumocystis organisms. Increased alveolar-capillary permeability is visible on electron microscopy. Before the widespread use of prophylaxis for P jiroveci pneumonia (PJP), the frequency of Pneumocystis infection in lung transplant patients alone was as high as 88%. Now, with the routine use of prophylaxis, PJP is very rare in solid-organ transplant patients and has significantly decreased in patients infected with HIV. Prior to the widespread use of highly active antiretroviral therapy (HAART), PJP occurred in 70%-80% of patients with HIV infection. The frequency of PJP is decreasing with the use of PJP prophylaxis and HAART. PJP is still the most common opportunistic infection in patients with HIV infection. Patients with HIV infection are more prone to PJP recurrence than patients not infected with HIV. In developing regions of the world, the prevalence of PJP was once thought to be much lower,  but studies have shown that the lower reported incidence is likely a failure to accurately diagnose PJP. An accurate diagnosis requires access to modern medical care, which is not available worldwide. In patients with HIV infection, PJP once carried a mortality rate of 20%-40%, depending on disease severity at presentation. Currently, mortality rates of 10%-20% are reported. PJP is still a major cause of death in patients with AIDS in the United States. In persons without HIV infection, PJP carries a worse prognosis  ; this has not changed significantly in the past 20 years. Mortality rates of 30%-50% have been documented in several large studies. The prognosis of PJP is worse in patients who present with concurrent pulmonary disease, in patients who develop pneumothorax, and in patients who require mechanical ventilation. The higher mortality rate is likely a result of delayed diagnosis and delayed initiation of appropriate treatment. Pulmonary symptoms: Pulmonary examination may reveal mild crackles and rhonchi but may yield normal findings in up to half of patients. Additional findings in children with severe disease include cyanosis, nasal flaring, and intercostal retractions. Although Pneumocystis infection rarely causes extrapulmonary manifestations, such findings may be present in patients receiving aerosolized pentamidine for prophylaxis or in patients with advanced HIV infection who are not taking any prophylaxis. They may also occur in the absence of lung involvement. A pathophysiologic process similar to acute respiratory distress syndrome (ARDS) may occur in patients with severe PJP. These patients may require intubation. This greatly diminishes the prognosis. A lactic dehydrogenase (LDH) study is performed as part of the initial workup. LDH levels are usually elevated (>220 U/L) in patients with P jiroveci pneumonia (PJP). They are elevated in 90% of patients with PJP who are infected with HIV. The study has a high sensitivity (78%-100%); its specificity is much lower because other disease processes can result in an elevated LDH level. LDH levels appear to reflect the degree of lung injury. They should decline with successful treatment. Consistently elevated LDH levels during treatment may indicate therapy failure and a worse prognosis. Chest radiography should be obtained in any immunocompromised patient with fever and/or respiratory signs or symptoms. The chest radiographic findings may be normal in patients with early mild disease. Diffuse bilateral infiltrates extending from the perihilar region are visible in most patients with P jiroveci pneumonia (PJP). Less-common findings include patchy asymmetric infiltrates, pneumothorax, and pneumatoceles. A radiographically normal chest radiograph has also been described. Pleural effusions and intrathoracic adenopathy are rare. Pneumothorax may also develop in patients using aerosolized pentamidine. Apical disease may also be found in patients using aerosolized pentamidine for prophylaxis, as shown in the image below. Chest radiograph demonstrating diffuse bilateral infiltrates in a patient with Pneumocystis jiroveci pneumonia. Go to Imaging Pneumocystis Carinii Pneumonia for complete information on this topic. High-resolution computed tomography (HRCT) scanning of chest is helpful when the chest radiography findings are equivocal. HRCT yields a high sensitivity for P jiroveci pneumonia (PJP) in patients with HIV infection. The typical appearance is patchy areas of ground-glass attenuation with a background of interlobular septal thickening. Negative (normal or unchanged) CT scan findings alone do not rule out PJP (see the image below). CT scan of chest, with classic patchy areas of ground-glass attenuation. Pulmonary function tests should be obtained as part of the initial noninvasive workup in patients with suspected P jiroveci pneumonia (PJP). Results may demonstrate a decreased diffusion capacity of carbon monoxide (DLCO) of less than 75% predicted. Decreased DLCO has a high sensitivity (89%-100%) but poor specificity (53%). PJP is unlikely if DLCO is normal. When combined with normal or unchanged HRCT findings, pulmonary function tests may be used to identify patients unlikely to have PJP; such patients may be managed with observation alone. Pulse oximetry on room air should be measured in all patients. The oxygen saturation should be measured both at rest and with exertion. If any hypoxemia is found (O2 saturation < 90%), then an arterial blood gas (ABG) level should be obtained to evaluate the need for possible adjunctive corticosteroids. The diagnosis of PJP should prompt consideration for HIV testing and other immune evaluations of lymphocytes and antibodies. If HIV testing is performed, appropriate pretest and posttest counseling guidelines must be followed. Serum LDH may be elevated in patients with PJP. If P jiroveci pneumonia (PJP) is strongly suspected, obtain a sputum sample by sputum induction for histopathologic testing. Pneumocystis organisms are frequently found in sputum induced by inhalation of a hypertonic saline solution. Sputum induction is the quickest and least-invasive method for definitively diagnosing PJP. Expectorated sputum has a very low sensitivity and should not be submitted for diagnosis. Pneumocystis antigen detection assays on sputum may also be helpful but may have a low sensitivity. The sensitivity of sputum induction varies widely (< 50% to >90%) and depends on proficiency in using the technique and the experience of the laboratory. Specificity is high (99%-100%). This study may be less sensitive in patients without HIV infection, as the immunodeficiency caused by HIV infection typically leads to a greater alveolar load of Pneumocystis organisms. It may also be less sensitive in patients receiving aerosolized pentamidine for prophylaxis. Obtain BAL if PJP is strongly suspected and the induced sputum sample findings are negative. BAL may be used in patients who are unable to cooperate with an induced sputum sample (eg, because of altered mental status). BAL may be less useful in cases of suspected PJP relapse. Consultation with a pulmonologist is required for BAL. Open lung biopsy is the most invasive procedure and yields 100% sensitivity and specificity because it provides the greatest amount of tissue for diagnosis. However, this procedure is reserved for rare cases when bronchoscopy findings are nondiagnostic. Because clinical and radiologic findings are not specific for PJP and because P jiroveci cannot be grown in vitro, histopathologic demonstration is necessary before a definitive diagnosis is established. The following are the staining techniques available for respiratory tract secretions. Crystal violet, Giemsa, Diff-Quik, and Wright stain are used to detect both the trophozoite and cyst forms but not the cyst wall. Diff-Quik stain demonstrating P jiroveci is seen in the image below. Diff-Quik stain demonstrating Pneumocystis jiroveci. Methenamine silver, toluidine blue, and Gram-Weigert selectively stain the wall of Pneumocystis cysts. Silver Gram stain showing P jiroveci is seen in the image below . Silver Gram stain showing Pneumocystis jiroveci. Papanicolaou smear may demonstrate a foamy-appearing eosinophilic material surrounding Pneumocystis organisms (as seen in the image below). 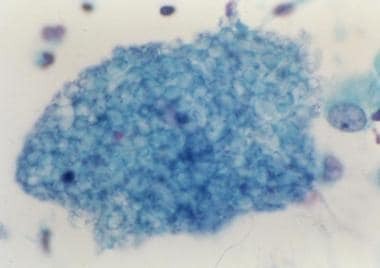 Papanicolaou smear of Pneumocystis jiroveci. Some facilities prefer to use direct immunofluorescence using monoclonal antibodies to detect Pneumocystis organisms because it may be more sensitive than histologic staining. Although a histopathologic demonstration of the organism is required for a definitive diagnosis (see Histologic Findings), treatment should not be delayed. Treatment of PJP may be initiated before the workup is complete in severely ill high-risk patients. Appropriate histopathologic testing may still be used to confirm a diagnosis of PJP after treatment is initiated. Endotracheal tube aspirates from severely ill patients on mechanical ventilation may be submitted for diagnosis. Pneumocystis organisms persist in the host for days to weeks after therapy is started, allowing time for completion of the appropriate workup. Treatment of PJP depends on the degree of illness at diagnosis. Degree of illness is determined based on the alveolar-arterial gradient: mild (< 35 mm Hg), moderate/severe (35-45 mm Hg), or severe (>45 mm Hg). Severe disease is also indicated by a room air partial pressure of oxygen lower than 70 mm Hg. Treatment of extrapulmonary manifestations of PJP is the same as that for other pneumonias. In patients without HIV infection, response to treatment should begin within 4-5 days. In patients infected with HIV, the treatment response typically takes longer but should occur within the first 8 days. If no response occurs within the expected time, an appropriate alternative regimen should be used. Adding additional PJP medications to a current regimen only increases the risk of adverse drug reactions without improving the likelihood of a good outcome. Up to 10% of mild-to-moderate PJP cases fail to respond to antibiotic treatment because of lack of drug efficacy. All patients who require corticosteroids should be admitted to the hospital because of the risk of progressive respiratory compromise. Because of increasing evidence of possible human transmission (see Pathophysiology and Etiology of PJP),  the CDC Hospital Infection Control Practice Advisory Committee has recommended that patients with PJP not have direct contact with other immunocompromised patients. Antibiotics are primarily recommended for treatment of mild, moderate, or severe P jiroveci pneumonia (PJP). TMP-SMX has been shown to be as effective as intravenous pentamidine and more effective than other alternative treatment regimens. [2, 35] The parenteral route may be considered in patients who present with serious illness or in those with gastrointestinal side effects. The recommended duration of treatment for PJP is 21 days in patients with HIV infection and 14 days in all other patients. Patients infected with HIV tend to have a higher organism burden and respond to treatment slower than patients without HIV infection and therefore require a longer duration of therapy. Corticosteroids are used as adjunctive initial therapy only in patients with HIV infection who have severe P jiroveci pneumonia (PJP) as defined by a room air arterial oxygen pressure of less than 70 mm Hg or an arterial-alveolar O2 gradient that exceeds 35 mm Hg. Adjunctive steroids are not recommended in patients without HIV infection. Arranging close medical follow-up with a primary care provider upon hospital discharge is essential to monitor resolution of disease and to initiate prophylactic medication (see Prevention of PJP). Oral therapy with TMP-SMX has been shown to be very effective in the outpatient setting. However, oral therapy should be considered only in patients with mild-to-moderate P jiroveci pneumonia (PJP) who have reliable outpatient follow-up care. Two types of outpatient chemoprophylactic therapies exist. Primary prophylaxis is used in immunocompromised patients without a history of PJP. Secondary prophylaxis is used in patients with a prior bout of PJP. Adults, adolescents, and pregnant patients with a CD4 count of less than 200/µL, oropharyngeal candidiasis, unexplained fever exceeding 100°F (37.7° C) for more than 2 weeks, and a prior episode of PJP regardless of CD4 count should receive prophylaxis. Children born to mothers with HIV infection should receive prophylaxis with TMP-SMX beginning at age 4-6 weeks, if HIV infection has not been "presumptively ruled out" by two negative HIV DNA PCRs (typically one at birth, with another after age 4 weeks). Many HIV-exposed newborns in the developed world with access to this kind of testing therefore may never need to start PJP prophylaxis. Children born to mothers with HIV infection who have had 4 negative HIV DNA PCRs (with one after at least age 4 months) or a negative HIV antibody test after age 6 months can be definitively said to be HIV-uninfected, and PJP prophylaxis can be safely discontinued. All children who are determined to be HIV-infected should receive prophylaxis through the first year of life, then as determined by age-specific CD4 levels. Prophylaxis may be discontinued in patients with HIV infection whose CD4 count exceeds 200/µL for 3 consecutive months while on HAART. Prophylaxis should be restarted if the CD4 count drops below 200/µL. Prophylaxis should be continued for life in patients who developed PJP while their CD4 level exceeded 200/µL. TMP-SMX is the agent of choice for PJP prophylaxis in the absence of a contraindication. In patients who cannot tolerate TMP-SMX, other options include dapsone, dapsone plus pyrimethamine, atovaquone, and aerosolized pentamidine. Commonly used prophylactic regimens are discussed below. For TMP-SMX, the normal dosage is one double-strength tablet (160 mg TMP to 800 mg SMX) daily. One single-strength tablet (80 mg TMP to 400 mg SMX) daily is also effective. Another alternative is one double-strength tablet 3 times per week. However, a daily-dosing regimen provides an additional benefit of cross protection against Toxoplasma gondii infection and other bacterial infections. For dapsone, the dosage is 100 mg daily by mouth if it is administered alone. If dapsone is given with pyrimethamine (plus leucovorin), the dosage is 50 mg of dapsone daily by mouth with 50 mg of pyrimethamine weekly and 25 mg of leucovorin weekly. Dapsone with pyrimethamine (plus leucovorin) provides protection against T gondii infection, but not other bacterial infections. For atovaquone, the dosage is 1500 mg by mouth once daily given with food. This agent has a low toxicity profile and is an alternative if the patient cannot tolerate TMP-SMX or dapsone. However, atovaquone is very expensive. For aerosolized pentamidine, the normal dosage is 300 mg in 6 mL sterile water via Respirgard nebulizer every 4 weeks. This agent is better tolerated than dapsone or TMP-SMX. However, it is much more expensive and less effective than other prophylactic agents. Side effects include cough and bronchospasm. The potential for extrapulmonary Pneumocystis manifestations and apical lung disease exists. In addition, aerosolized pentamidine may diminish the diagnostic sensitivity of sputum induction and bronchoalveolar lavage. What is Pneumocystis jiroveci pneumonia (PJP)? When was Pneumocystis jiroveci pneumonia (PJP) first identified? What is the role of Pneumocystis jiroveci pneumonia (PJP) in HIV infection? How is Pneumocystis jiroveci pneumonia (PJP) diagnosed and when should treatment be initiated? What is the treatment for Pneumocystis jiroveci pneumonia (PJP)? What is the microbiology of the Pneumocystis genus? Where are Pneumocystis organisms commonly found? How is Pneumocystis organisms transmitted? What is the pathogenesis of Pneumocystis jiroveci pneumonia (PJP)? What are risk factors for Pneumocystis jiroveci pneumonia (PJP)? How prevalent is Pneumocystis jiroveci pneumonia (PJP)? What is the mortality rate for Pneumocystis jiroveci pneumonia (PJP)? What are the signs and symptoms of Pneumocystis jiroveci pneumonia (PJP)? What are the physical findings suggestive of Pneumocystis jiroveci pneumonia (PJP)? What extrapulmonary symptoms of Pneumocystis jiroveci pneumonia (PJP)? What are possible complications of Pneumocystis jiroveci pneumonia (PJP)? Which conditions should be included in the differential diagnosis of Pneumocystis jiroveci pneumonia (PJP)? What is the role of lab testing in the diagnosis of Pneumocystis jiroveci pneumonia (PJP)? 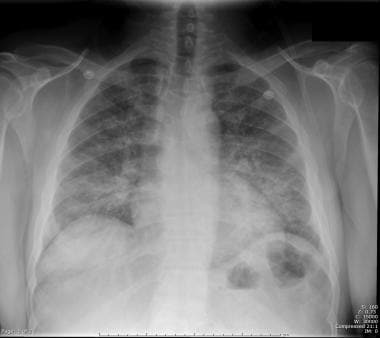 What is the role of radiography in the diagnosis of Pneumocystis jiroveci pneumonia (PJP)? 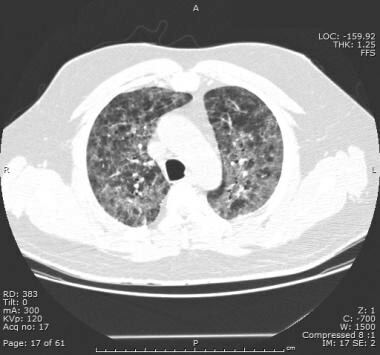 What is the role of CT scanning in the diagnosis of Pneumocystis jiroveci pneumonia (PJP)? What is the role of pulmonary function testing in the diagnosis of Pneumocystis jiroveci pneumonia (PJP)? What is the role of pulse oximetry in the diagnosis of Pneumocystis jiroveci pneumonia (PJP)? When is HIV testing indicated in the workup of Pneumocystis jiroveci pneumonia (PJP)? 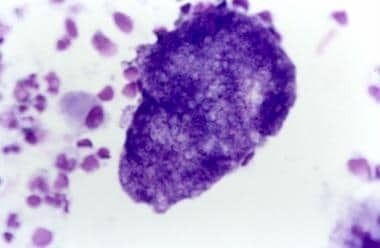 What serum LDH findings suggest Pneumocystis jiroveci pneumonia (PJP)? When should a sputum sample be obtained in the workup of Pneumocystis jiroveci pneumonia (PJP)? What is the specificity and sensitivity of sputum induction in the workup of Pneumocystis jiroveci pneumonia (PJP)? What is the role of bronchoalveolar lavage (BAL) in the diagnosis of Pneumocystis jiroveci pneumonia (PJP)? When is open lung biopsy indicated in the workup of Pneumocystis jiroveci pneumonia (PJP)? 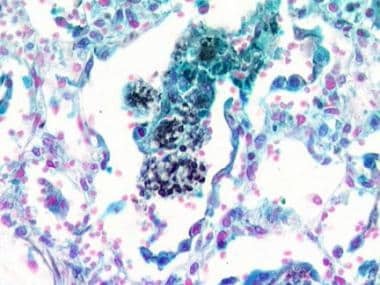 Which staining techniques are used for histologic evaluation of Pneumocystis jiroveci pneumonia (PJP)? What is the treatment of choice for Pneumocystis jiroveci pneumonia (PJP)? When should treatment be initiated for Pneumocystis jiroveci pneumonia (PJP)? How is degree of illness determined in Pneumocystis jiroveci pneumonia (PJP)? When is treatment response expected in Pneumocystis jiroveci pneumonia (PJP)? When is inpatient treatment indicated for Pneumocystis jiroveci pneumonia (PJP)? What are CDC hospital infection control recommendations for Pneumocystis jiroveci pneumonia (PJP)? What antibiotic regimen are effective for treatment of Pneumocystis jiroveci pneumonia (PJP)? What is the indication for adjunctive corticosteroid therapy for Pneumocystis jiroveci pneumonia (PJP)? What follow-up care is necessary for Pneumocystis jiroveci pneumonia (PJP)? How does smoking affect the disease course of Pneumocystis jiroveci pneumonia (PJP)? What are the US Public Health Service-IDSA guidelines for chemoprophylaxis guidelines prophylaxis against Pneumocystis jiroveci pneumonia (PJP)? Which patients should consider chemoprophylaxis against Pneumocystis jiroveci pneumonia (PJP)? What is the regimen for TMP-SMX prophylaxis against Pneumocystis jiroveci pneumonia (PJP)? What is the chemoprophylactic regimen for dapsone in reference to Pneumocystis jiroveci pneumonia (PJP)? What is the chemoprophylactic regimen for atovaquone in reference to Pneumocystis jiroveci pneumonia (PJP)? What is the chemoprophylactic regimen for aerosolized pentamidine in reference to Pneumocystis jiroveci pneumonia (PJP)? Benson C, Kaplan J, Masur H. Treating opportunistic infections among HIV-infected adults and adolescents: recommendations from CDC, the National Institutes of Health, and the HIV Medicine Association/Infectious Diseases Society of America. Clin Infect Dis. 2005. 40:S131. Safrin S, Finkelstein DM, Feinberg J, et al. Comparison of three regimens for treatment of mild to moderate Pneumocystis carinii pneumonia in patients with AIDS. A double-blind, randomized, trial of oral trimethoprim-sulfamethoxazole, dapsone-trimethoprim, and clindamycin-primaquine. ACTG 108 Study Group. Ann Intern Med. 1996 May 1. 124(9):792-802. [Medline]. Cunha BA. Pneumonia Essentials. 2nd ed. Royal Oak, Mich: Physicians Press; 2007. Cushion MT, Stringer JR. Has the name really been changed? It has for most researchers. Clin Infect Dis. 2005 Dec 15. 41(12):1756-8. [Medline]. Gigliotti F. Pneumocystis carinii: has the name really been changed?. Clin Infect Dis. 2005 Dec 15. 41(12):1752-5. [Medline]. Slogrove AL, Cotton MF, Esser MM. Severe Infections in HIV-Exposed Uninfected Infants: Clinical Evidence of Immunodeficiency. J Trop Pediatr. 2009 Jul 14. [Medline]. Schmoldt S, Schuhegger R, Wendler T, et al. Molecular evidence of nosocomial Pneumocystis jirovecii transmission among 16 patients after kidney transplantation. J Clin Microbiol. 2008 Mar. 46(3):966-71. [Medline]. de Boer MG, Bruijnesteijn van Coppenraet LE, Gaasbeek A, et al. An outbreak of Pneumocystis jiroveci pneumonia with 1 predominant genotype among renal transplant recipients: interhuman transmission or a common environmental source?. Clin Infect Dis. 2007 May 1. 44(9):1143-9. [Medline]. Mori S, Polatino S, Estrada-Y-Martin RM. Pneumocystis-associated organizing pneumonia as a manifestation of immune reconstitution inflammatory syndrome in an HIV-infected individual with a normal CD4+ T-cell count following antiretroviral therapy. Int J STD AIDS. 2009 Sep. 20(9):662-5. [Medline]. Kolditz M, Halank M, Bandt D, Spornraft-Ragaller P, Höffken G. Early recurrence of Pneumocystis jiroveci pneumonia in two HIV-infected patients: linking infection relapse and immune reconstitution syndrome. Respirology. 2009 Aug. 14(6):910-2. [Medline]. Hui M, Kwok WT. Pneumocystis carinii pneumonia in Hong Kong: a 10 year retrospective study. J Med Microbiol. 2006 Jan. 55:85-8. [Medline]. Mori S, Cho I, Sugimoto M. A followup study of asymptomatic carriers of Pneumocystis jiroveci during immunosuppressive therapy for rheumatoid arthritis. J Rheumatol. 2009 Aug. 36(8):1600-5. [Medline]. Resnick IB, Averbuch D, Aker M, et al. Is Pneumocystis carinii pneumonia after stem cell transplantations a contagious disease?. Clin Transplant. 2005 Jun. 19(3):427-31. [Medline]. Byers DK, Decker CF. Unusual case of Pneumocystis jiroveci pneumonia during primary HIV infection. AIDS Read. 2008 Jun. 18(6):313-7. [Medline]. Sax P. HIV Essentials. Royal Oak, Mich: Physicians Press; 2007. Ritter ML, Pirofski L. Mycophenolate mofetil: effects on cellular immune subsets, infectious complications, and antimicrobial activity. Transpl Infect Dis. 2009 Aug. 11(4):290-7. [Medline]. [Full Text]. Barbounis V, Aperis G, Gambletsas E, et al. Pneumocystis carinii pneumonia in patients with solid tumors and lymphomas: predisposing factors and outcome. Anticancer Res. 2005 Jan-Feb. 25(1B):651-5. [Medline]. Abouya YL, Beaumel A, Lucas S, et al. Pneumocystis carinii pneumonia. An uncommon cause of death in African patients with acquired immunodeficiency syndrome. Am Rev Respir Dis. 1992 Mar. 145(3):617-20. [Medline]. Murray JF. Pulmonary complications of HIV-1 infection among adults living in Sub-Saharan Africa. Int J Tuberc Lung Dis. 2005 Aug. 9(8):826-35. [Medline]. [Full Text]. Su YS, Lu JJ, Perng CL, Chang FY. Pneumocystis jirovecii pneumonia in patients with and without human immunodeficiency virus infection. J Microbiol Immunol Infect. 2008 Dec. 41(6):478-82. [Medline]. Fujii T, Nakamura T, Iwamoto A. Pneumocystis pneumonia in patients with HIV infection: clinical manifestations, laboratory findings, and radiological features. J Infect Chemother. 2007 Feb. 13(1):1-7. [Medline]. Festic E, Gajic O, Limper AH, et al. Acute respiratory failure due to pneumocystis pneumonia in patients without human immunodeficiency virus infection: outcome and associated features. Chest. 2005 Aug. 128(2):573-9. [Medline]. Cunha BA, Schoch PE, Berbari N. Cryptococcal vs Pneumocystis (carinii) jiroveci pneumonia (PCP): Clinical & Microbiology differential diagnsotic considerations. Infect Dis Pract. 2006. 30:514-517. Grover SA, Coupal L, Suissa S, et al. The clinical utility of serum lactate dehydrogenase in diagnosing pneumocystis carinii pneumonia among hospitalized AIDS patients. Clin Invest Med. 1992 Aug. 15(4):309-17. [Medline]. Alanio A, Desoubeaux G, Sarfati C, Hamane S, Bergeron A, Azoulay E, et al. Real-time PCR assay-based strategy for differentiation between active Pneumocystis jirovecii pneumonia and colonization in immunocompromised patients. Clin Microbiol Infect. 2011 Oct. 17(10):1531-7. [Medline]. Botterel F, Cabaret O, Foulet F, Cordonnier C, Costa JM, Bretagne S. Clinical Significance of Quantifying Pneumocystis jirovecii DNA by Using Real-Time PCR in Bronchoalveolar Lavage Fluid from Immunocompromised Patients. J Clin Microbiol. 2012 Feb. 50(2):227-31. [Medline]. [Full Text]. Onishi A, Sugiyama D, Kogata Y, Saegusa J, Sugimoto T, Kawano S, et al. Diagnostic Accuracy of Serum 1,3-ß-D-Glucan for Pneumocystis jiroveci Pneumonia, Invasive Candidiasis, and Invasive Aspergillosis: Systematic Review and Meta-Analysis. J Clin Microbiol. 2012 Jan. 50(1):7-15. [Medline]. [Full Text]. DeLorenzo LJ, Huang CT, Maguire GP, et al. Roentgenographic patterns of Pneumocystis carinii pneumonia in 104 patients with AIDS. Chest. 1987 Mar. 91(3):323-7. [Medline]. Coleman DL, Hattner RS, Luce JM, et al. Correlation between gallium lung scans and fiberoptic bronchoscopy in patients with suspected Pneumocystis carinii pneumonia and the acquired immune deficiency syndrome. Am Rev Respir Dis. 1984 Dec. 130(6):1166-9. [Medline]. Bigby TD, Margolskee D, Curtis JL, et al. The usefulness of induced sputum in the diagnosis of Pneumocystis carinii pneumonia in patients with the acquired immunodeficiency syndrome. Am Rev Respir Dis. 1986 Apr. 133(4):515-8. [Medline]. Bigby TD. Diagnosis of Pneumocystis carinii pneumonia. How invasive?. Chest. 1994 Mar. 105(3):650-2. [Medline]. Broaddus C, Dake MD, Stulbarg MS, et al. Bronchoalveolar lavage and transbronchial biopsy for the diagnosis of pulmonary infections in the acquired immunodeficiency syndrome. Ann Intern Med. 1985 Jun. 102(6):747-52. [Medline]. Ceballos ME, Ortega M, Andresen M, Wozniak A, García P, Balcells ME. Successful treatment with echinocandin in an HIV-infected individual failing first-line therapy for Pneumocystis jirovecii pneumonia. AIDS. 2011 Nov 13. 25(17):2192-3. [Medline]. Gianella S, Haeberli L, Joos B, Ledergerber B, Wüthrich RP, Weber R, et al. Molecular evidence of interhuman transmission in an outbreak of Pneumocystis jirovecii pneumonia among renal transplant recipients. Transpl Infect Dis. 2009 Sep 9. [Medline]. Estrada S, García-Campos F, Calderón R, Delgado E, Bengoa R, Enciso C. Pneumocystis jiroveci (carinii) pneumonia following a second infusion of infliximab in a patient with ulcerative colitis. Inflamm Bowel Dis. 2009 Feb. 15(2):315-6. [Medline]. Thomas M, Rupali P, Woodhouse A, Ellis-Pegler R. Good outcome with trimethoprim 10 mg/kg/day-sulfamethoxazole 50 mg/kg/day for Pneumocystis jirovecii pneumonia in HIV infected patients. Scand J Infect Dis. 2009 Aug 17. 1-7. [Medline]. Smego RA Jr, Nagar S, Maloba B, et al. A meta-analysis of salvage therapy for Pneumocystis carinii pneumonia. Arch Intern Med. 2001 Jun 25. 161(12):1529-33. [Medline]. [Full Text]. Benfield T, Atzori C, Miller RF, et al. Second-line salvage treatment of AIDS-associated Pneumocystis jirovecii pneumonia: a case series and systematic review. J Acquir Immune Defic Syndr. 2008 May 1. 48(1):63-7. [Medline]. Bozzette SA. The use of corticosteroids in Pneumocystis carinii pneumonia. J Infect Dis. 1990 Dec. 162(6):1365-9. [Medline]. Bozzette SA, Sattler FR, Chiu J, et al. A controlled trial of early adjunctive treatment with corticosteroids for Pneumocystis carinii pneumonia in the acquired immunodeficiency syndrome. California Collaborative Treatment Group. N Engl J Med. 1990 Nov 22. 323(21):1451-7. [Medline]. Miguez-Burbano MJ, Ashkin D, Rodriguez A, et al. Increased risk of Pneumocystis carinii and community-acquired pneumonia with tobacco use in HIV disease. Int J Infect Dis. 2005 Jul. 9(4):208-17. [Medline]. Opportunistic Infections Project Team of the Collaboration of Observational HIV Epidemiological Research. Is it safe to discontinue primary Pneumocystis jiroveci pneumonia prophylaxis in patients with virologically suppressed HIV infection and a CD4 cell count Clin Infect Dis</i>. 2010 Sep 1. 51(5):611-9. [Medline]. Sibanda EL, Weller IV, Hakim JG, Cowan FM. Does trimethoprim-sulfamethoxazole prophylaxis for HIV induce bacterial resistance to other antibiotic classes? Results of a systematic review. Clin Infect Dis. 2011 May. 52(9):1184-94. [Medline]. [Full Text]. Ewald H, Raatz H, Boscacci R, Furrer H, Bucher HC, Briel M. Adjunctive corticosteroids for Pneumocystis jiroveci pneumonia in patients with HIV infection. Cochrane Database Syst Rev. 2015 Apr 2. 4:CD006150. [Medline].